Do you have one of those kids that love to look in the mirror? You know the type – always mugging, smiling, or posing in the bathroom. Or the type that use the iPad to take dozens of pictures and videos of themselves doing nothing but staring into the camera. These are the kids that will be Oscar winners and supermodels, the ones that can’t get enough of their cheesy little mugs. 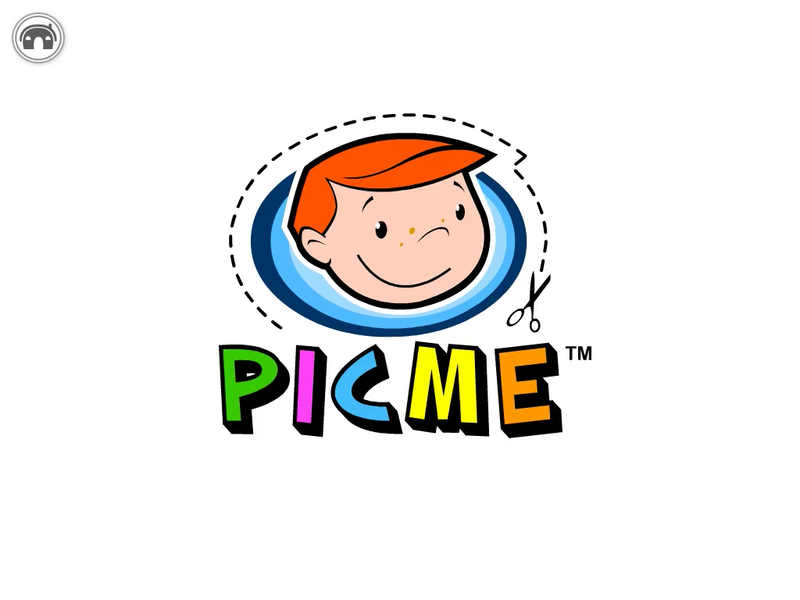 PICME is a show that this Moviebook app is based on, and the creators must have known how much fun it is for a little one to see themselves as the star of an animated short. Now no one has to wait for the show on TV or hope that their picture submission was turned into a mini-movie. 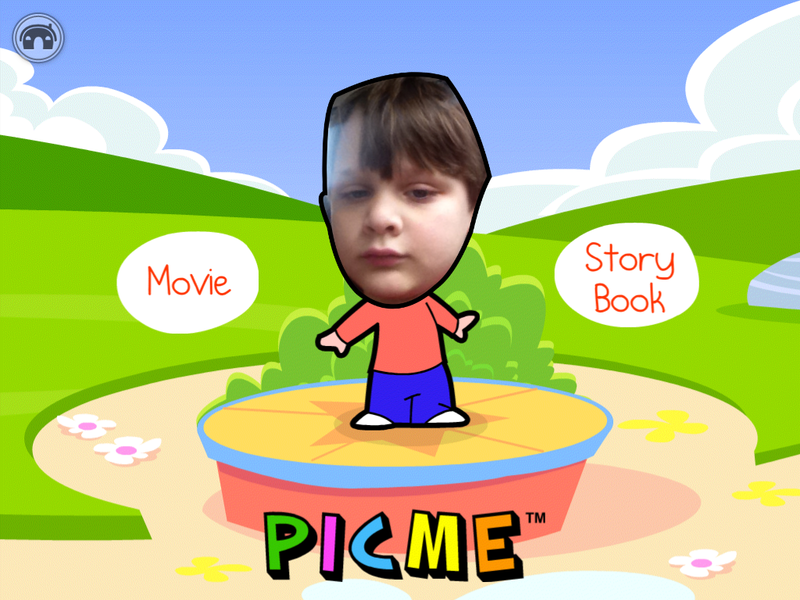 PICME Moviebook allows your child to take a photo and transform it into the main character of a fun story and an adorable short movie. 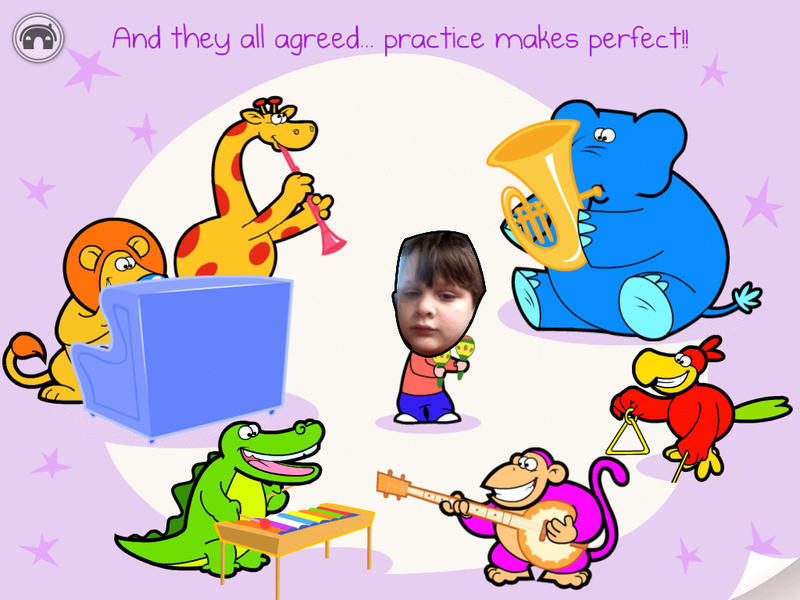 I downloaded this app when the kids were sleeping and I thought it would be a fun surprise to add my son as the star of the app. I chose a picture of his face (which he took of himself, one of at least 15 in a series) and cropped it using the game’s very simple directions. Soon I was watching as he taught a talking elephant to play the piano. My daughter played the game first and was tickled to find her Bub (brother) “in” the iPad. She came running to show me, thrilled and a little confused. Bub was a little less outwardly enthusiastic but I have seen him try to figure out how exactly his face got into the story. Once I showed him how to choose and edit a pic he was off and running, changing the main character from himself to his sister. We were a fan of the original show which airs on Sprout, a cable channel from parent network PBS. Now that we have the fun at our fingertips, we’re even bigger fans. Even though this app has only two modes – storybook and movie – the interaction factor is stellar. For $2.99 there’s a whole lot of play time in this app, and your kiddo seeing their own face in a fun and engaging app is priceless. – Fun touch-driven animations on every page. Get ready to take a trip to Hollywood because this app will make your kiddo think they’re a star!